Clubs? That’s easy to figure out. The cell phone? At 75, he’s still an incredibly busy man. And Pete Luster? He’s the last in a short list of chief pilots—a “good little fraternity”—who have shared the cockpit with Palmer. “I go where he goes,” Luster confirms. For Luster, that means splitting his time between Orlando, which he calls home, and Latrobe, Penn., Palmer’s hometown and home of Arnold Palmer Regional Airport. Luster, a former military pilot who has held other corporate flying jobs, says he sees one big difference in working for Palmer. Palmer has spent a lot of time in the air, much of it in the left seat. The legendary professional golfer has about 18,000 flight hours, built up over five decades. He pauses when asked if he’s been an inspiration for other golfers to take up flying. Since several golfers have also become pilots, some people have speculated about the mindset required of each. 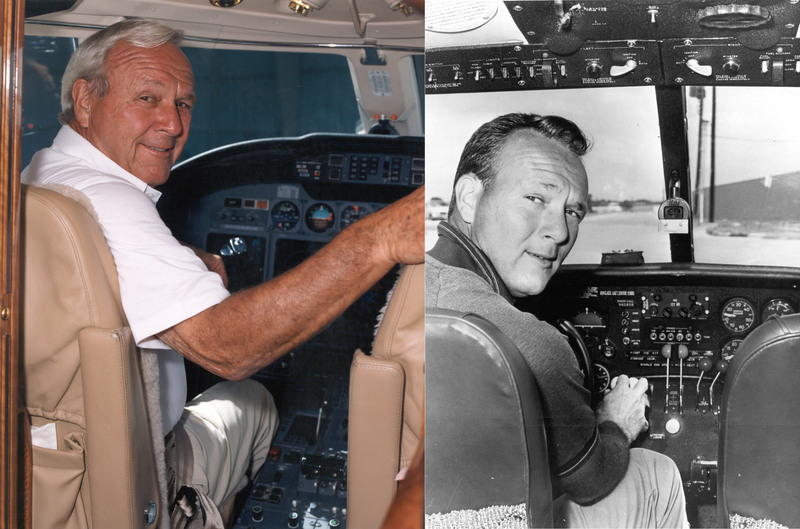 Arnold Palmer acquired his first jet, a Jet Commander, in 1966, and took possession of his first Citation X in 1996. He’s shown in the cockpit of both. One of the best-known sportsmen and small business owners in the world, Palmer has won 92 national and international championships, 61 of them on the U.S. Tour (starting with the 1955 Canadian Open). His golf titles include four Masters, two British Opens and the 1960 U.S. Open. He also has represented the United States seven times in the Ryder Cup Matches as either a player or captain. He was recognized for his achievements in an Associated Press poll as the “Athlete of the Decade” for the 1960s. During his career, Palmer has received virtually every national award in golf as well as the Hickok Athlete of the Year and Sports Illustrated’s Sportsman of the Year in 1960 (after that stellar season). Between 1960 and 1963, his hottest period on the Tour, he landed 29 of his titles and collected almost $400,000. He was the leading money-winner in three of those four years and twice represented the U.S. in the Ryder Cup Match. A charter member of the World Golf Hall of Fame, he’s also a member of the PGA Golf Hall of Fame and the American Golf Hall of Fame. His awards include a Lifetime Achievement Award, PGA Tour, 1998, the Donald Ross Award, American Society of Golf Course Architects, 1999, and Patriot Award, Congressional Medal of Honor Society. He’s a past honorary national chairman of the March of Dimes Birth Defects Foundation and the Arnold Palmer Hospital for Children and Women. Palmer, who underwent successful prostate cancer surgery in 1997, and has become a strong advocate of programs supporting cancer research and early detection, is president of Arnold Palmer Enterprises, a multi-division structure encompassing much of his global commercial activity that is centered in Cleveland. He has been involved in automobile and aviation service firms over the years and still is the principal owner of Arnold Palmer Motors, an automobile dealership in Latrobe. In addition, he is the sole owner of Latrobe Country Club, majority owner of the Bay Hill Club & Lodge, part owner of the Pebble Beach Golf Complex and the consultant to and former chairman of The Golf Channel. He heads Palmer Course Design Company, which has designed or remodeled some 250 golf courses around the world, and has ties to Arnold Palmer Golf Management Company and Arnold Palmer Golf Academy. During his early days on the Tour, Palmer’s rapidly growing business interests took flight through his impetus, under the guidance of the late Mark H. McCormack, his business manager, and IMG (International Management Group), McCormack’s wide ranging organization, which today is the world’s premier sports and lifestyle management and marketing firm. IMG was sold in September 2004 to New York investment firm Forstmann Little and Co.
McCormack and Palmer knew each other through college golf. Shortly after that, McCormack asked Palmer to join him in putting together a company representing golfers. But when McCormack expressed that he wanted Palmer on an exclusive basis, Palmer, knowing McCormack had another partner, and that the two of them represented about 10 or 12 golfers, told him he could have an exclusive with him if he gave up everybody else—including his partner. McCormack later agreed to that. When he asked for a contract, Palmer said a handshake should do, and with the handshake, became his client. Palmer would later say that although McCormack was very smart, he added a good dose of “common sense” to the partnership. Born on Sept. 10, 1929 in Latrobe, Palmer grew up in a small house near the then sixth hole of Latrobe Country Club. When he was a young boy, his father worked at the club as a golf professional and course superintendent. Arnold Palmer would often sit for hours watching golfers tee off. He began caddying at the club at 11 and worked at almost every job there in later years. He concentrated on golf in high school and won his first of five West Penn Amateur Championships when he was 17. He competed successfully in national junior events and at Wake Forest College became the number one man on the golf team and one of the leading collegiate players of that time. When Bud Worsham, a close friend and golf teammate, died in an automobile accident, a troubled Palmer withdrew from college, during his senior year. He began a three-year stint in the U.S. Coast Guard. His interest in golf was rekindled while he was stationed in Cleveland. After his discharge from the service, he returned to Wake Forest to finish his education, but left before graduation and began working in sales in Cleveland. In the late summer of 1954, he won the coveted U.S. Amateur Championship in Detroit, following a second straight victory in the Ohio Amateur earlier in the season. That same year, shortly after he turned pro, he married Winifred Walzer, whom he met at a tournament in eastern Pennsylvania. His beloved “Winnie,” who died in 1999, due to cancer, began traveling with him when he joined the pro tour in early 1955, and continued to do so until their daughters, Peggy and Amy, reached school age. There was another big change in Palmer’s life around that time. When he was 20, while traveling on a DC-3 to an amateur golf tournament, the plane flew through a thunderstorm. Arnold Palmer with his first Citation X, in the mid-1990s. That incident prompted Palmer to want to learn more about aviation. That wasn’t the first time he had made that decision. When he was about 9 years old, he had a slightly older friend who was interested in aviation. “We collaborated in building model airplanes,” he said. In the late thirties, another friend introduced him to acrobatics. He vowed to learn to fly when he could afford it. When he finished the year on tour, in 1955, he began taking flying lessons, and soloed in 1956, getting his private pilot’s license that same year. He learned to fly with Babe Krinock, at Latrobe Airport (Westmorland County Airport), which is now Arnold Palmer Regional Airport. “I started getting into flying big time,” he said. Palmer wasn’t the first golfer to fly himself to tournaments. That distinction belongs to the late golf pioneer, Johnny Bulla, who played regularly on the PGA men’s tour in the 1930s. He’d often bring passengers along with him. When Palmer first started flying to tournaments, he often ended up with passengers as well. In his early flying days, Palmer trained in Cessna 172s, 175s and 180s, and began chartering aircraft. He bought his first plane, an Aero Commander 500, in 1961. In 1963, Palmer traded up to a Commander 560F. He acquired his first jet, a Rockwell Jet Commander, three years later, in February 1966, becoming the first athlete to own his own jet. During that period, Darryl Brown, a former test pilot for Rockwell, served as Palmer’s chief pilot. When Brown decided to pursue other ventures, Palmer began looking for a replacement. At the time, Charlie Johnson, a former F-105 pilot for the U.S. Air Force—and proud River Rat—was flying for Figi’s, a cheese and gourmet foods company. In 1972, Johnson’s father called him to say he had found a perfect job for him in the Wall Street Journal. Johnson applied for the job. Johnson said he had a “nice” title, but, he was actually Palmer’s “insurance” pilot. He adds that Palmer is “probably the best natural pilot” he’s ever flown with in his life. By the time Johnson joined him, Palmer had started flying a Learjet. Shortly after being hired, Johnson earned his type rating in the Learjet at FlightSafety. The process took him three days. Johnson was soon used to Palmer’s hectic schedule, which made for some “pretty long days.” Most often, Palmer would fly in the left seat when they headed out for their destination. Johnson often took that seat on the way home. 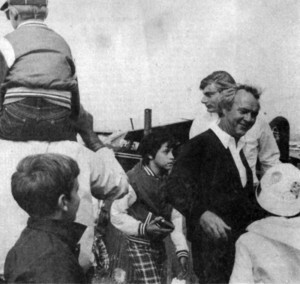 In early 1973, Johnson would introduce Palmer to Lee Lauderback, who would eventually become Palmer’s next chief pilot. He said that back then, he sometimes needed another pilot to fly as second-in-command. Arnold Palmer at Latrobe Airport with a rented Cessna 172, in his early flying days. Lauderback, who began his aviation ventures as a glider pilot and did some corporate and charter work before that fortuitous meeting with Johnson, recalled that when they met, Johnson was looking for a copilot to take the Lear 24 from Orlando back to Latrobe. When they ended up getting a Part 135 certificate so they could charter Palmer’s airplane out, Johnson needed a fulltime copilot. “Instead of hiring one and moving him all around the country, I hired Lee and a pilot in Pennsylvania, Bob Agostino, who is now the director of flight operations for Learjet,” he said. Lauderback recalled that they did quite a lot of charter work at that time. In 1975, Johnson turned over the title of chief pilot to Lauderback, after taking a position at Gates Learjet as chief of production flight test. He would later move over to Cessna Aircraft Company, eventually becoming president and COO. Johnson acknowledged that the move was completed family related. He recalls that their partnership wasn’t the normal employer-employee relationship. Lauderback admits to shying away from actually playing golf with Palmer. Lauderback said he went out of his way for many years “not” to prove he wasn’t a good golfer. However, around 1983, Palmer called Lauderback into his workshop, not far from Lauderback’s office, and gave him a bag of clubs. Then, he instructed him to pick up some golf shoes from downstairs and make sure that the clubs and shoes were on the plane the next day, because he was going to teach him to play, once they reached their destination of Palm Desert, Calif. The two men were soon on the driving range. Lauderback said his boss worked with him, and after that, they sometimes played golf together. 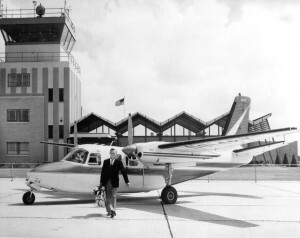 Arnold Palmer with his Aero Commander in the early 1960s, at Latrobe Airport. Part of that experience was realizing Palmer’s ability to identify with people. While flying with Palmer, Lauderback would become very familiar with Cessna aircraft models. Palmer’s long-term relationship with that aircraft started with Russ Meyer, now chairman emeritus of Cessna. After the Lear 24, Palmer began flying a Citation I, before going into a Citation II and then a Citation III. Johnson said Palmer acquired the first production Citation III. Palmer would own two Citation IIIs, before moving on to a Citation VII. In the mid-eighties, after talking about it for some time, Palmer acquired a Hughes MD500E helicopter. Lauderback said he went through instructor status in helicopters, and then trained Palmer. 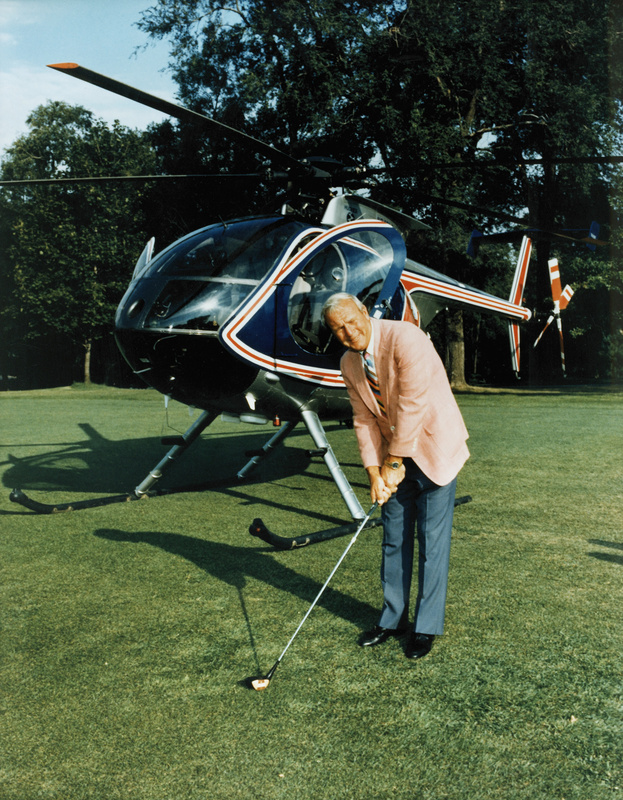 Palmer said he definitely enjoyed the helicopter, but eventually sold it because he couldn’t justify the use of it. “I wasn’t flying it enough,” he said. Lauderback recalls that Palmer kept the helicopter for about two years after he resigned his position as chief pilot in 1990. He explains that the dynamics of his situation began changing after he got married in 1977. “I ran into the same issues that Charlie Johnson was running into, except I stayed and ended up in a divorce situation,” he said. Lauderback would go on to make a name for himself with Stallion 51, the world’s premier P-51 Mustang flight operation, located in Kissimmee, Fla., which he still runs. Arnold Palmer answers questions about his Lear 24 while Charlie Johnson, his chief pilot, waits patiently nearby. Johnson explained that at that time, before there was an operational simulator, you could get an LOA and convert it to the type rating. He also said Palmer had a hand in the design of the Citation X. 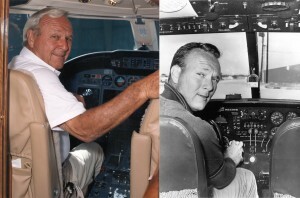 The same year Palmer acquired his first Citation X, he was again in the market for a chief pilot, and chose another former military pilot, Pete Luster. Luster said he went into the Air Force right from Purdue University, where he was involved in ROTC. After receiving his commission, he went to pilot training in 1966, at Del Rio, Texas. His first assignment out of pilot training was Vietnam; he flew the F-4 on a tour there, before instructing in the T-38 and then flying the F-111. After getting out of the Air Force, he went to work for Cessna as a demonstration pilot, in 1986. “While I was with Cessna, I got checked out in all the different varieties of Citations,” he said. Luster was in Wichita for less than two years. One day, he gave a Citation II demo flight to a man who owned a golf resort and a company in northern Michigan. That person offered him a job, after buying the Citation II. After five and a half years in that position, Luster went on to St. Louis, to work for Siegel-Robert, another privately-owned company. For Siegel Robert, he flew a Citation I, Citation V, Citation VII, Challenger and GIV. He was there for almost four years, but left when the owner died. “I’ve been lucky to work for good people my whole aviation career,” he said. 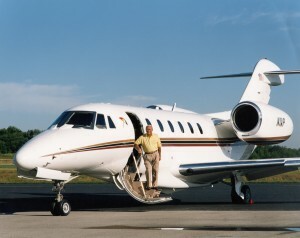 He began flying with Palmer right after the golfer acquired his first Citation X. “We did all the screening on all his pilots in all Cessna airplanes,” Johnson added. At that point, Palmer wasn’t type rated. Luster went to school immediately to be type rated, and Palmer got typed about a year later. Palmer flew that airplane for three years, before taking possession of unit 176. “I picked it up in February 2002,” Palmer said of the aircraft he flies today. Luster says there are some differences between Palmer’s first and second Citation Xs. Luster says there’s no way an airplane can compete with the military jets he’s flown as far as “fun” is concerned, but as far as corporate jets he’s flown, the Citation X is definitely the most enjoyable. Palmer has put many miles on both his Citation Xs. No matter what his business is, chances are he’ll be rounding up Luster for a trip. “If the bathroom’s far away, I fly my Citation X,” he quips. Over the years, Palmer’s aviation business has included owning a fixed base operation at Latrobe, and owning “part” of Palwaukee Municipal Airport in Chicago, including a fixed base operation at that airport. He no longer owns either of those FBOs. “At one time we ran a charter service out of my Latrobe office,” he added. These days, besides Luster, Palmer, now a grandfather seven times over, often flies with his fiancée Kit, and a yellow Labrador retriever named “Mulligan.” The latest of a long line of Palmer dogs, which have included golden retrievers and German shepherds, “Mulligan” seems to be content on flights. As for Luster, he says he’s become accustomed to living in two cities. 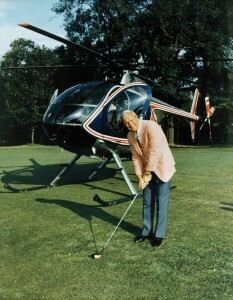 Arnold Palmer acquired a Hughes MD500E in the mid-1980s. 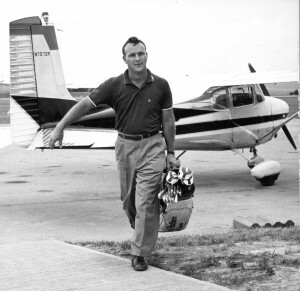 Lee Lauderback, his chief pilot at the time, said the ability to go from golf course to golf course added a lot of capability to his flight department. Luster smiles and says Palmer would probably have trouble denying that working for him has caused a little turmoil in former pilots’ lives, due to his demanding schedule. Although he jokes that he is hoping things might still slow down “a little more” as time goes by, Luster says he has no complaints. The Palmer-Luster partnership should work well, as long as Luster’s girlfriend, Mary, continues to be flexible as well. Although the schedule might not be as demanding as it once was, Luster says there’s no way to describe a “typical” week or month. “They’re all enough different to keep me interested,” he said. Palmer said how often they fly these days varies month to month. “Some months we fly probably five or six hours a week,” he said. Luster says there’s almost always a trip or two in support of the course design company, while sponsors Palmer endorses generate others. Luster says that although changes might come up, he’s usually able to plan his life out reasonably well. Luster says that the cockpit situation has changed a little, regarding who’s sitting in the left seat. Besides yearly European flights, flying with Palmer has given Luster the chance to visit England and Scotland. A little closer to home, they fly to Hawaii almost every year. Flights that stand out in his mind include those made to Costa Rica and Portugal, since they’re places he hadn’t been to before trips with Palmer. Those trips were related to golf course design work. He says the course design company probably has generated half their trips out of the country, but that those trips often include a golf tournament Palmer is playing in or possibly business related to other aspects of the businessman’s life. Palmer serves as a spokesperson for several companies including Rolex, Pennzoil, Invacare, GlaxoSmithKline and Administaff, Inc.
Palmer’s blessed in that his aviation heroes are in many cases also his good friends. Palmer’s made many memorable flights, including one he made as captain in a Lear 36 in 1976, in which he set a new around-the-world class record, 22,984 miles, completed in 57 hours, 25 minutes and 42 seconds. An honorary Blue Angel and Thunderbird, Palmer has also flown most of the military aircraft, from DC-9s to F-15s and F-16s. A good friend of President Dwight D. Eisenhower, Palmer also had a chance to land an aircraft on a carrier named in his honor. He landed on the “USS Eisenhower” after the commander of the Atlantic fleet asked him if he’d entertain the troops. “I did that down in Puerto Rico,” he said. In those earlier days, returning from a tournament, Palmer often viewed flying as a welcome distraction, especially if the day’s results weren’t exactly what he had hoped. These days, Palmer says the enjoyment is still as rich, but flying a jet presents different challenges. 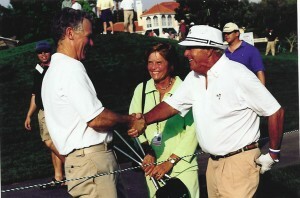 Lee Lauderback and Arnold Palmer shake hands, as Palmer’s fiancée, Kit Gawthrop, looks on.